If the climactic ending of their last meeting is anything to go by, Ireland vs France Six Nations tickets will soon be the hottest items in town. Ireland’s match with England, in the first round of the Six Nations Championships on February 2, is already sold out and tickets are selling for more than 10 times their face value. In fact, the Ireland vs France Six Nations match at the Aviva Stadium on March 10 has also sold out and tickets are much sought after in the secondary market. 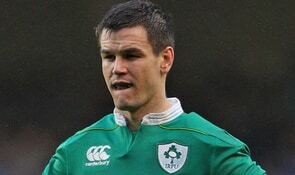 One reason the demand is so high is that it will be the Irish team’s only other home match in this year’s Six Nations. Their next home matches will be the Rugby World Cup warmup matches against Italy and Wales in August and September. But the main reason demand for Ireland Six Nations tickets will be hot is the way Ireland snatched last year’s game at the death. It was a finish that France will be keen to make up for. The Irish should beware. And a finish that shows why rugby union is the greatest TEAM sport of all. A recap: France, playing their first match under new coach Jacques Brunel, were playing reasonably well in an otherwise dull match. They had scored the games’ only try, a beauty by winger Teddy Thomas, and led 13-12 with about five minutes to go. They were then awarded a penalty. Unfortunately, young fly-half Anthony Belleau missed the reasonably easy kick. A miss that proved crucial as it meant Ireland needed only a penalty kick or dropped goal to win the match. The only problem was that Ireland were deep in their own half and about 30 metres from the halfway line. Far away, in other words, from striking range of the French goalposts. And first they had to win the ball back from the 22m drop-out, which is usually a 50-50 proposition at best. But win back the ball the Irish did. Through lock, Iain Henderson. After which, they started to recycle the ball. Remember: there were fewer than three minutes go, they were about 75m from the French line, and it was imperative that the ball be kept alive. Which they did, for 41 phases, before flyhalf Johnny Sexton coolly slotted over the winning drop goal from more than 40 metres out. A true heart breaker for the French. Again, that scintillating passage of play and control by the Irish shows why rugby union is the greatest team sport of all. That injury-time winning kick would not have been possible had the WHOLE TEAM not worked hard and selflessly to retain possession and to get into the right position over 41 — yes, 41 — phases. It had to be perfect: one mistake and the whole thing breaks down and the referee would have blown the final whistle. Someone could have thrown a forward pass. Instead, all Joe Schmidt’s men played their roles to perfection, with the halfbacks, Conor Murray (number 9) and Sexton (10), directing the flow. Even referee Nigel Owens played his part, possibly giving players on both sides the benefit of the doubt, and letting a few marginal decisions be unpunished, for the sake of a positive winner rather than penalising someone and deciding the game with a deflating penalty kick. The players responded in kind. All the players took turns carrying the ball forward, and no risks were taken, aside from one, when Sexton kicked ahead to winger Keith Earls (3:15 in the video). There was even a point when Sexton went down injured, probably with cramp (3:18). Instead of breaking the flow, Murray kept the move going, using his forwards and whoever else stepped up to play first receiver, until Sexton had recovered and started calling the for the ball again. It was a seamless production. It was also a question of being technically correct at every turn, until the timing was right, which Sexton and Murray alone decided. You can see this at the 5:22 mark, when, for a rare time in the move, and just before the winning kick came, the two men talked to each other. All this was done in the last minutes, remember, and in the one long passage of play. Which meant that the players would have been extremely tired. 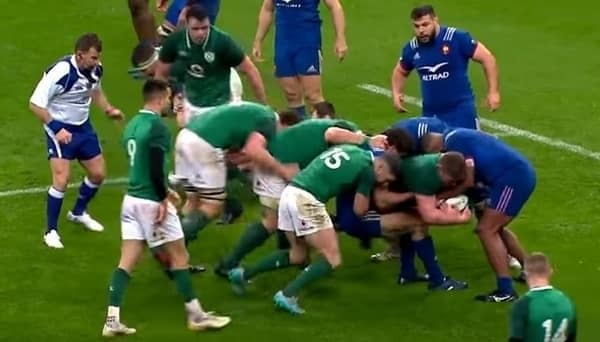 But the Irish ignored all that and drew on all their reserves of fitness and training to steal the game from the French who, it must be said, defended very well and presented no openings for a try. The only way the Irish could have scored were if they had won a penalty (but the French kept their discipline) or via a drop goal (the much harder option). But score it they did. Didn’t the All Blacks do something similar? Observant viewers may have noticed how similar the Irish finish above was to the one the All Blacks had in 2013 — against Ireland, of all teams. New Zealand too had one final play with which to win the game, and did so with a converted try in the corner. While some might say that scoring a try made the Kiwi finish superior to the Irish one, the key difference to note is that the All Blacks started out much closer to the Irish line than the Irish were from the French one. Also, New Zealand were awarded a penalty and so could create a momentum that the Irish above could not get from a 22m drop-out. Most importantly of all, this was a hardened and experienced World Champion All Blacks side playing against a team that, up to then, had never beaten them — ever. For the Irish, that was one massive psychological hurdle to overcome. In the match last year, however, the French had no such hang-up. Since that match, the Irish have built on their position. They have gone through 2018 unbeaten, including finally beating the All Blacks on home soil last November. This makes them the team to beat in this year’s Six Nations, and a hot favourite for the Rugby World Cup 2019. And the French, for one, will be gunning for revenge for last year. Click here to check out where you can get your Ireland Six Nations tickets. I think this will be a cracker. Ireland would have won 2 matches by then, after their humiliation by england so beating france will keep them alive. France will go in after playing and beating scotland so it will be do or die. Whatever it is, Ireland will want to go all out because they can still win the whole six nations competition. Yes, unfortunately both have since lost their first matches. But it’s still a match worth watching. Teamwork really pays. The Irish couldn’t have won if they didn’t have one goal in mind, which is to win. Even when the task of scoring looks so daunting, yet with one purpose, they worked towards achieving their goal.You are right you know, people will be so keen to see how it plays out this period, having in mind that Irish snatched the game from France last year. France will definitely go an extra mile in reciprocating. The French would have felt hard done by in that game, as they had scored the only try of the match and did most things right. A win would have got them off to a good start under their new coach. As it was, it ended up with a very patchy year including ending the year with another defeat, at home, against Fiji. But before any thoughts of revenge, the French have a hard task on February 1, against Wales. This is very interesting how the good vgame qame went but you have said irish team were playing without giving the ball for the last few minutes that might have created alot suspense with fans from both side. Ok have they qulified for the world cup I hope so that they can be able to play with countries like Kenya in one stage. Unfortunately, Kenya did not qualify for the World Cup. The countries from Africa that qualified were South Africa and Namibia. Kenya had made it to the final qualifying stage, but lost out to Canada. Maybe we’ll see Kenya in the next repechage. The last match between Ireland and France sounds like it was full of excitement! I love it when the underdog team comes through with a win right at the end of the match. What a great recap and I love that teamwork from the Irish team brought them their success! I can’t wait to see how the next match between Ireland and France unfolds. I’m not sure Ireland was an underdog in that game. But to steal the game in 41 very hard and physical phases while creeping into overtime and not have the ball die or the game will be over, is a herculean effort in any context. And then to achieve the winning goal with a drop kick (which is akin to shooting a bull’s eye on horseback), it’s a phenomenal victory. 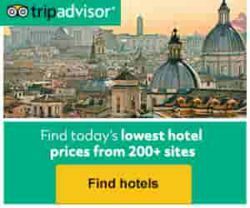 I would not know so much information if I did not read your article about getting Ireland VS France six nations tickets. I believe your article will be useful for all sports lover. Some of my friends want those ticket. 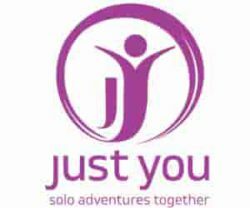 Can you please tell me where it will be available easily and is there any discount offer for a group? I am going to share this with them. Thanks for posting this important news. I’m afraid, at the level we’re now talking about where tickets are sold out to a highly anticipated game, there’s no option of a discount in any context. In the secondary market offered by the likes of LiveRugbyTickets and StubHub, it’s the fans who are re-selling their tickets that set the price. And unless the reseller has enough tickets for your group, buyers at this late hour are forced to take what’s available; even if it means sitting far apart.